An innovative and successful businessman, Herbert Edward Pratten was born at Mangotsfield in Gloucestershire (near Bristol), England, on 7 May 1865, the son of Herbert Graham Pratten, baker, and his wife, Ann Rebecca, née Vowles. He attended the Bristol Trades and Mining School and was appointed to a clerkship in the Bristol ironworks of John Lysaght, who exported iron and steel to Australia. In 1884,Pratten arrived in Sydney, starting work at Lysaght’s branch at Five Dock and later setting himself up as a manufacturer of soft drinks at Ashfield. By the early 1900s, he had established a printing and advertising business, Pratten Brothers. Other business enterprises with which Pratten was associated included a jam factory, the early export of fruit pulp to Great Britain, and gold and tin mining. On 29 May 1891, at ‘Milleewa’, Arthur Street, Ashfield, he married Agnes, daughter of John Wright, boot manufacturer. Pratten took a strong interest in Asia, visiting the region on a number of occasions. He published two small books on his experiences and observations. In Asiatic Impressions (1908), a collection of his articles first published in the Sydney Daily Telegraph, he wrote about his trip in 1906 to the Philippines, Japan, China, Malaya, Singapore and India. He dedicated the book ‘to all Australians who realise the many racial dangers that the future may have in store for our beautiful land’. He asserted that the ‘trend of the World’s Politics is towards the Pacific’. He highlighted the ‘friction between the United States and Japan, Canada and Japan, and the Transvaal and India [which] has arisen owing to the growing competition of the colored races of Asia’. Yet he also contended that economic developments in Asia—especially in China and India—were providing trade opportunities for Australia. Accordingly, he recommended that Commonwealth trade commissioners, located at Shanghai and Calcutta, should replace state government representatives. Somewhat similar views were expressed in Through Orient to Occident, probably written in 1912, following a trip the previous year to South–East Asia and China, which had included travelling on to Europe by the Trans–Siberian railway. Pratten was impressed with the entrepreneurial spirit of the Chinese. He identified lack of education as the major reason for China’s economic backwardness. Yet he believed that significant changes were occurring in China as a result of the nationalist revolution. Again he called for alterations to Australian commercial representation in Asia. The conclusions he drew from his observations and discussions in Asia provided information for speeches he was later to make in the Parliament. Between 1905 and 1912, Pratten had been elected three times an alderman of Ashfield, serving as mayor from 1909 to 1911. He was president of the New South Wales Chamber of Manufactures (1912–14). In 1915, his business acumen was recognised when he became associated with the British munitions parliamentary committee that aimed at increasing the production of munitions and other war materials. He undertook engagements throughout the principal coal mining and industrial districts of Britain. For this work, he received a letter of appreciation from the British Prime Minister, David Lloyd George. 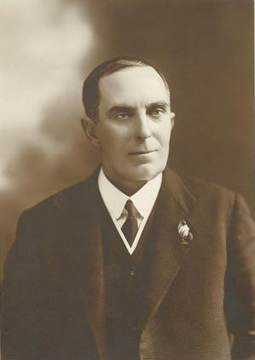 Pratten failed in his candidature for the House of Representatives seat of Parkes as an Independent in 1910, and was again unsuccessful when he stood as a Liberal for the Senate for New South Wales in 1914. In May 1917, he was elected to the Senate as a Nationalist. He resigned on 23 November 1921 to contest, successfully, a by-election on 10 December for the House of Representatives seat of Parramatta, left vacant by the resignation of Sir Joseph Cook. As a result of a redistribution of electoral boundaries, at the 1922 federal election Pratten contested the new electorate of Martin. He was returned unopposed, and re-elected in November 1925. Pratten’s extensive business background and experience influenced his political attitudes and activities. He took the view, for example, that while it was legitimate for governments to provide incentives to private companies for promotional purposes, they should not themselves manage business enterprises as political imperatives were likely to lead to the jettisoning of sound business practices. He favoured the employment of ‘business men’ in the defence department and the separation of military and bureaucratic functions. Governments, too, he asserted, must live within their means. He opposed the financing from overseas loans of budget deficits. He argued against too hastily creating an ‘all-powerful’ department of trade and commerce. In the Senate, Pratten spoke on a variety of topics, but most frequently he debated issues of a commercial nature, including trade, tariffs, loans, banking, taxation, industrial matters, shipping and defence. He also took an interest in parliamentary procedure and scrutiny. In May 1918, he argued that provision should be made for direct questioning of public servants at the Bar of the Senate or through the responsible minister. In 1920, he supported a motion by Josiah Thomas, which proposed that ministers in either House should be allowed to speak in ‘the other place’ on legislation for which they had responsibility. For four of his six and a half years in the House of Representatives, Pratten was minister for trade and customs. He was responsible for introducing legislation to establish the Tariff Board on a permanent basis, though as a senator he had opposed in principle the creation of the Board on the grounds that it would arrogate to unelected officials responsibilities that more properly should lie with the Parliament. He now took the view that Australian industry must be protected from the effects of currency depreciation and dumping of low priced products. Regarded as more protectionist than his predecessor, Austin Chapman, he introduced major amendments to the Customs Tariff Act in 1926 and 1928, which significantly increased tariff rates on imported goods. Pratten considered the purpose of the tariff was to augment the size of the Australian population by creating new industries and expanding existing ones. He held that ultimately this would strengthen the defence capability of the nation. By raising trade preferences for British producers, he believed also that he was safeguarding the security of the nation by improving the economic capacity of the British Empire. On a visit to Britain, Europe, the United States and Canada in 1927, he undertook trade negotiations and promoted Australia as a destination for overseas investment. Pratten was a key figure in negotiating the compact between the Nationalist and Country parties that led to the deposition of W. M. Hughes and the elevation of S. M. Bruce to the office of Prime Minister in February 1923. Some commentators at the time speculated that Pratten might be appointed prime minister, though Pratten himself appears to have coveted the post of treasurer. His position as Deputy President of the New South Wales National Association (1920–27) ensured his appointment as Minister for Health (13 June 1924–16 January 1925) and Minister for Trade and Customs (13 June 1924–7 May 1928). By 1926, Pratten, who had been mentioned as an eventual successor to Bruce as prime minister, was ranked fourth in the Government. While addressing a gathering of the women’s branch of the Turramurra Nationalist Association on 7 May 1928 (his sixty-third birthday) Pratten collapsed and died. He received a state funeral and was buried in the Methodist section of the Northern Suburbs Cemetery. Pratten left behind his wife, sons, Herbert and John, and daughters, Agnes, Ethel and Grace. In condolence motions, Pratten was described as an able and conscientious administrator who was in full command of his portfolio. The Leader of the Opposition in the Senate, Labor’s Senator Needham, adjudged that he was the most outstanding minister for trade and customs since the inauguration of the Commonwealth. James Scullin, another political opponent and later prime minister, noted that even ‘in the heat of debate, he was always a gentleman, and because of that won the admiration and esteem of all his fellow members’. Pratten was succeeded as the Member for Martin by his nephew, F. G. Pratten. British-Australasian (London), 28 December 1911, p. 11; Punch (Melbourne), 10 June 1920, p. 866; Daily Telegraph (Sydney), 20 February 1922, p. 9; Table Talk (Melbourne), 9 February 1928, pp. 8, 22. H. E. Pratten, Asiatic Impressions: A Collection of Articles, Fergusson, Sydney, 1908, ‘Preface’, pp. 85, 93; Through Orient to Occident , pp. 25–32, 41; SMH, 25 November 1921, p. 10; CPD, 23 January 1918, pp. 3386–3387. British-Australasian (London), 18 November 1915, p. 29; H. E. Pratten, Commonwealth Senate Elections, May 5th, 1917. A Message to the People of New South Wales, Sydney, 1917, Pam., NLA; SMH, 7 May 1917, p. 6, 19 November 1921, p. 13, 21 November 1921, p. 8, 26 November 1921, p. 14, 12 December 1921, p. 9. SMH, 27 October 1919, p. 6; British Australian and New Zealander (London), 10 May 1928, p. 7; SMH, 16 July 1921, p. 11; Daily Telegraph (Sydney), 30 April 1921, p. 12; CPD, 18 April 1918, pp. 4028–4033, 5 December 1918, p. 8819, 15 July 1921, pp. 10128–10136, 29 May 1918, p. 5175, 18 April 1918, pp. 4023–4033, 24 May 1918, p. 5098, 13 May 1920, pp. 2067, 2071; David Pope, ‘Pratten, Herbert Edward’, ADB, vol. 11. CPD, 20 July 1921, pp. 10271–10276, 2 September 1924, pp. 3802–3807, 2 September 1925, pp. 2095–2115, 24 November 1927, pp. 1881–1896; Geoffrey Sawer, Australian Federal Politics and Law 1901–1929, MUP, Carlton, Vic., 1956, pp. 193, 232. Ulrich Ellis, A History of the Australian Country Party,MUP, Parkville, Vic., 1963, pp. 96, 118; B. D. Graham, The Formation of the Australian Country Parties, ANU Press, Canberra, 1966, pp. 183, 185, 190; Argus (Melbourne), 29 December 1922, p. 7, 1 February 1923, p. 9, 2 February 1923, p. 9. Argus (Melbourne), 8 May 1928, p. 15, 10 May 1928, pp. 15, 16; SMH, 8 May 1928, p. 11; Australian Worker (Sydney), 9 May 1928, p. 18; Industrial Australian and Mining Standard (Melbourne), 10 May 1928, p. 440; Australian Sugar Journal, 7 June 1928, p. 203; CPD, 9 May 1928, pp. 4693-4697. This biography was first published in The Biographical Dictionary of the Australian Senate, vol. 1, 1901-1929, Melbourne University Press, Carlton South, Vic., 2000, pp. 61-64.